JEWELS announced last week that because their Mar. 11 show was cancelled because of the earthquake, they will run a double header May 14 at Shin-kiba 1st Ring. There will be a show in the afternoon and a show in the evening. Earthquake relief fundraising will be the focus of the event. They announced two kickboxing matches for the afternoon show and they will have other kinds of fights on the show including amateur matches. But the big news is that the evening show will be JEWELS vs VALKYRIE. Fans have been asking me about VALKYRIE and though there has been no announcement, VALKYRIE owner Greatest Common Multiple (GCM) is out of business. They also own CAGE FORCE. Basically, those guys have fallen off the face of the earth. And I also understand their cage and other equipment is in storage and they have defaulted on the storage fees. So VALKYRIE GM Yasuko Mogi wants to keep the company alive and has decided to do this JEWELS show to keep the name alive. Somebody mentioned that she needs a sponsor. She needs more than that. Mogi doesn't own any equipment. GCM owns it all. She needs a money mark...er...Yakuza boss...er...investor so she can buy equipment. It's well known that Mogi doesn't see eye to eye with JEWELS matchmaker Shigeru Saeki but she admitted that GCM has nothing planned and she doesn't have much choice. And it's a good opportunity. Saeki admitted this partnership would not have been possible two years ago and gives Mogi credit for biting the bullet. They announced two matches for the show. In a match contracted for 48kg, Misaki Takimoto will represent JEWELS vs VALKYRIE's Sugi Rock. The veteran Takimoto trains at Zendokai in Yokohama. 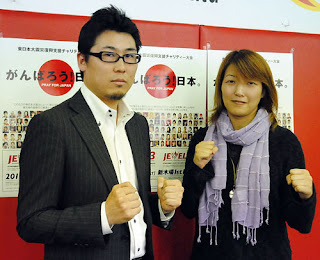 Her record is 13-11-4 and her last fight was a split decision win over Amy Davis on the Dec. 30 Sengoku show. I watched the fight. She got a gift from the judges. Rising star Sugi Rock trains at the A3 branch of WK. She is 3-0 and her last win was a non-title win over VALKYRIE Flyweight Champ Yasuko Tamada on the Nov. 28 VALKYRIE show. She was due for a title shot. She's very quick. I expect her to win easily. In a match contracted for 48kg, MIYOKO will represent JEWELS vs VALKYRIE's SACHI. MIYOKO trains at Grabaka. Her record is 2-2 and her last fight was a win over Asami Higa on the Dec. 17 JEWELS show. SACHI trains at Dark Silk (I think). She switched dojos recently and is returning after a 1 1/2 year absence. Her last fight was a win over Maho Muranami on the Oct. 24, 2009 VALKYRIE show. She has also worked for JEWELS. Obviously neither fight is a main event. We'll see what else they come up with. AccuRadio Song Of The Day-Esquerita!